Kristen Calfee, a senior marketing major, sings at the Residence Hall Association's "Talent Under Twinkle Light." This year’s open mic event aimed to showcase a collection of students’ unique talents in a night under the stars. 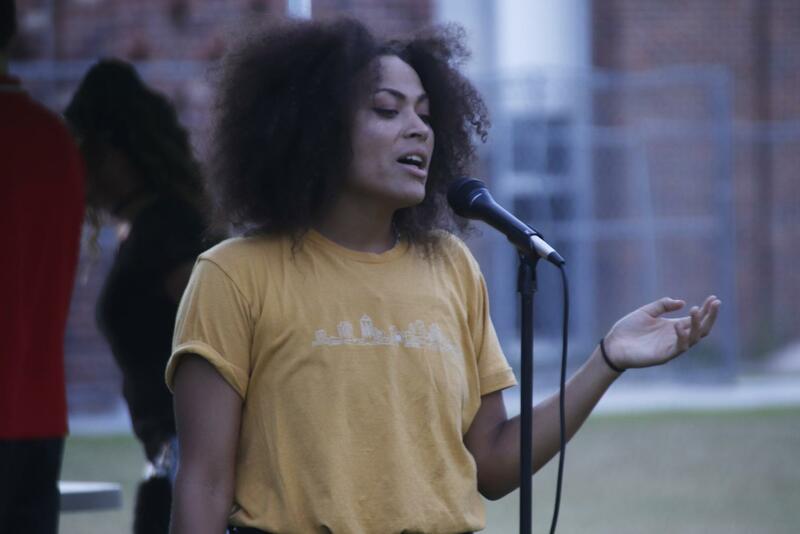 The Residence Hall Association created “Talent Under Twinkle Light” in order to give students on campus a chance to interact with their peers. The second annual event was held near Twelve Oaks Courtyard on Wednesday, Sept. 19. Students arrived as early as 5:30 p.m. for seating while the performance acts began at 6:30 p.m.
Chandler Baptiste, a freshman criminal justice major, shared his experience performing at the event. RHA works toward providing students a friendly atmosphere to develop connections with one another. Along with the performances, the RHA served light refreshments and charged $5 per person for henna tattoos in order to raise money for the organization. The night also included a scavenger hunt and a dance-off that aimed to keep the crowd engaged.